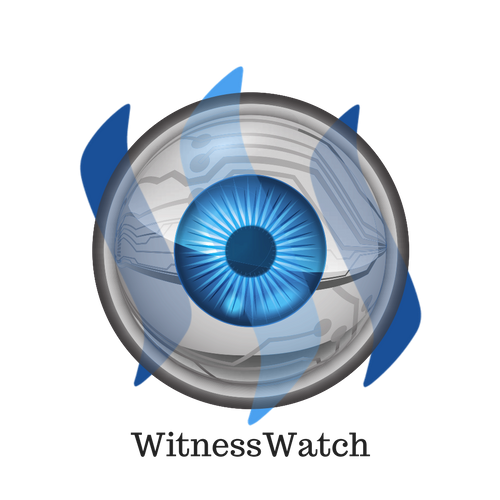 WitnessWatch Weekly Report #8: How much do witnesses make? Have you ever wondered what witnesses make? STEEM witnesses are the secret sauce that make Steemit function. Every post you submit, transfer you send, and vote you cast are processed by the witnesses. Being a witness is a big responsibility, and the equipment and maintenance can be expensive and time-intensive. Because of this, witnesses are compensated with SP for every "block" of transactions that they process. 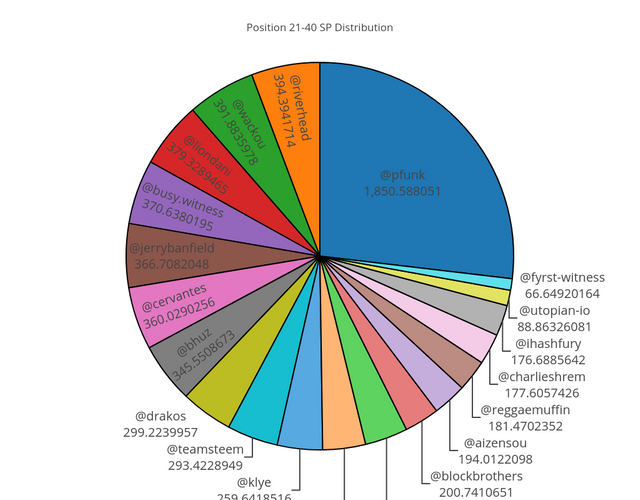 The blockchain, through the witnesses, processes 21 blocks of transactions in each 63-second round. 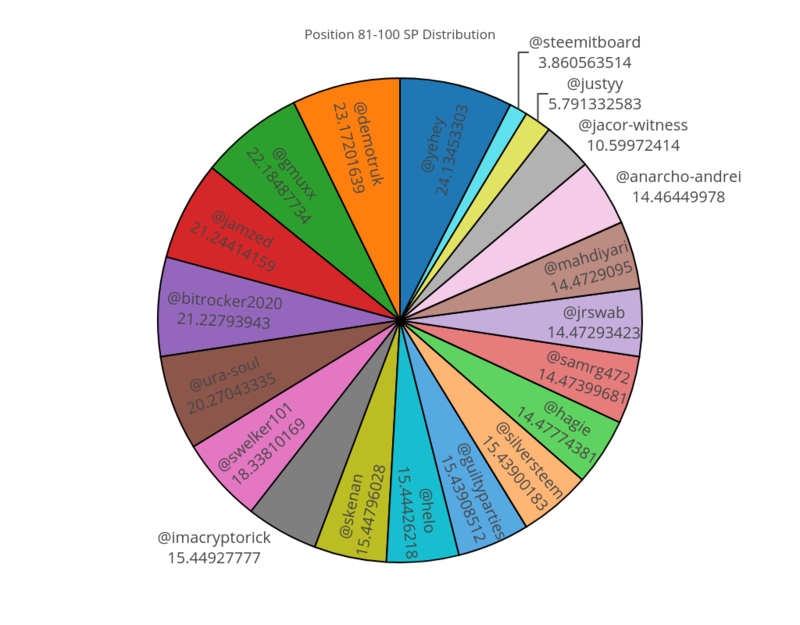 The top 19 witnesses get 1 block every round, with the other 2 blocks being distributed among the other active witnesses according to their ranking. We want to emphasize that witness rewards do not come from the reward pool. 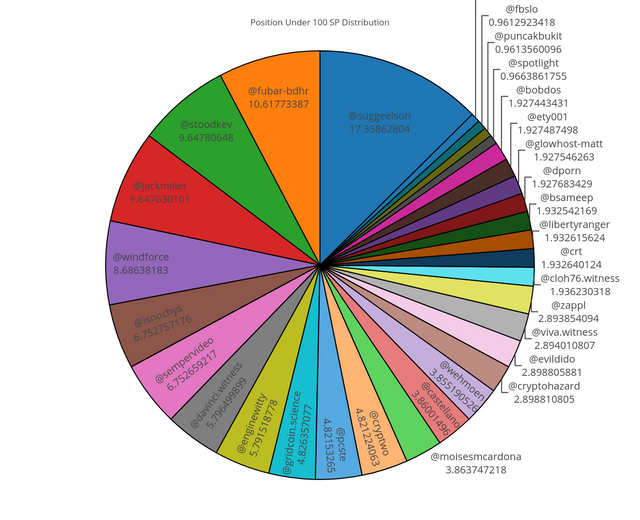 As new tokens are created, a certain percentage is distributed to authors and curators, while the witness rewards are distributed from another percentage. They are two separate pots. We have run a script that has analyzed every block over the last 7 days to calculate what each witness earned over the week. This post was put together using data pulled from @steemsql, thanks to @arcange. We are happy to subscribe to the SteemSql service as it has become infinitely more reliable and we are thrilled to support @arcange's work. 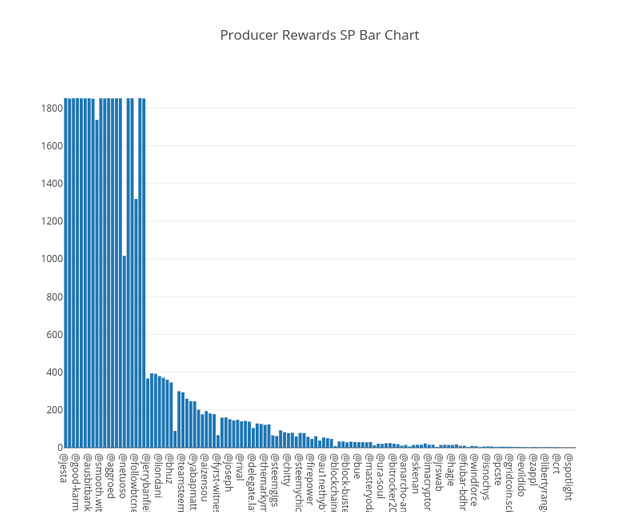 This bar chart shows the distribution of SP earned by witnesses over the last week. As you can see, the earnings drop off significantly for those that aren't in the top 20. 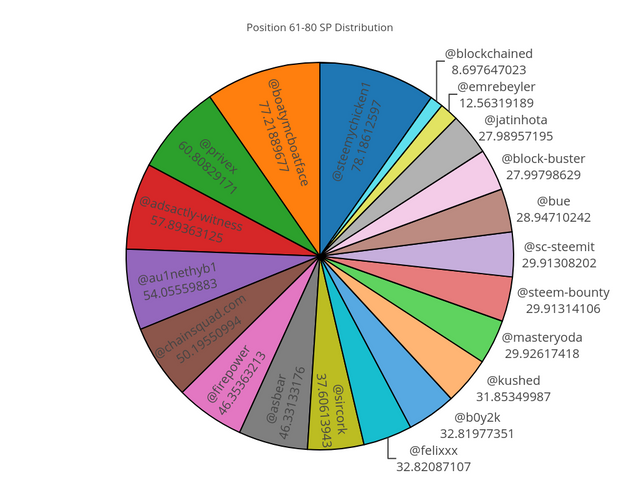 This is due to the fact that the top 20 witnesses handle the bulk of the transactions that occur on the STEEM blockchain. Because of this, their overhead is significantly higher, especially as the blockchain continues to grow. 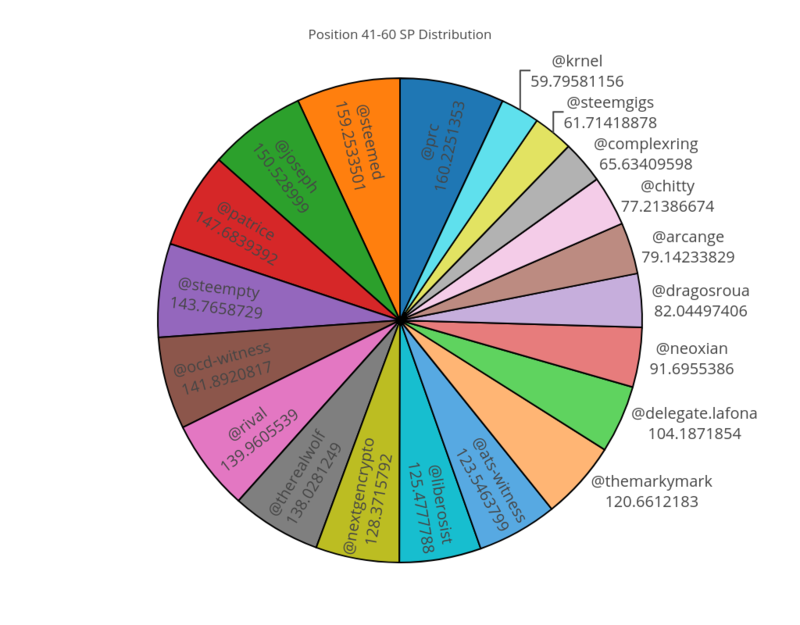 We have reorganized our pie chart visualizations into earning tiers. This will allow a much clearer picture of the way earnings are distributed to the various witnesses. 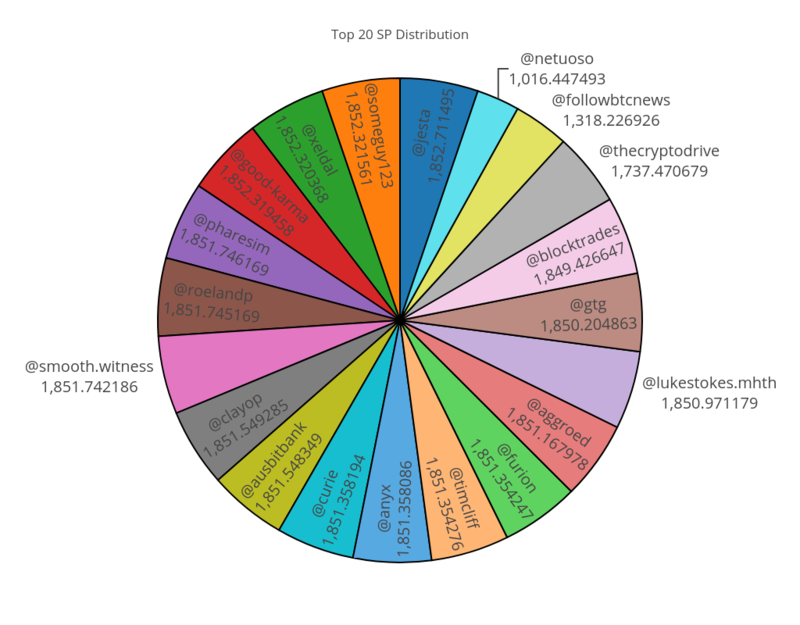 Here is the full table of results, this totals all witness earnings in SP and the USD equivalent over the last week, sorted by each witness' ranking. As always, the data presented above is meant to allow Steemians to make more informed decisions on the witness votes that they cast. Stay tuned for more data soon! Let us know what data you would like to see! Vote responsibly! If you enjoy our work, please follow, upvote and resteem! This is something I never understood, really cool post, and appreciate the transparency. Oh, I see, there is my name. So the top 20 can earn more than $4k a week. And in the past this was a bit higher when the Steem price was higher. Do these witnesses spend like 40 hours a week? Or do they have very high expenses? I mean $18k income per month is suberb! Some of them seem to be here 24/7. That's kind of sick of someone really earns this much and isn't even around. Could be caused by the fact that some people just vote for witnesses once and then never change it. Or just because they have a few whale votes. So does it means the top ones are running with best infrastructure to process the transactions and that is why earn more ? How does our vote impacts this ? That is correct, because of the volume of transactions they process, their hardware has to be state of the art. The top 20 are the top witnesses that have been voted for and have the most cumulative votes. If you feel they are doing a good job, you can add your vote to their total. If there is another witness that you feel should have a shot at the top 20, you can add your vote to their total.